익산 관음사 목조보살입상은 보살상의 복장에서 발견된 발원문에서 임진왜란과 정유재란을 겪은 이후 황폐해진 사찰을 재건해 가는 일련의 과정을 상세히 전하고 있어 兩大戰亂 이후 활발하게 이루어진 불교 재건사업과 관련된 생생한 자료를 제공한다. 이 불상을 조성한 원오는 1599년에 상원사 목조문수동자상(국보 제221호)을 개금한 수조각승으로, 16세기 후반에서 17세기 전반까지의 불교조각계를 연결시켜 주는 중요한 인물이다. 이 불상의 보조조각승 청허는 원오의 작품경향을 계승하여 17세기 중반까지 활발하게 활동한 조각승이다. 따라서 이 불상은 원오유파(元悟流派)의 조각의 형성과 흐름을 이해하는 데 매우 중요한 위치에 있는 불상이다. 양식적으로도 이 불상은 부드럽고 사실적인 조각기법을 바탕으로 한 안정된 조형감을 보여 주는데, 이는 16세기 후반의 조각 경향을 계승한 17세기 초반 작품의 특징이다. 이 상은 17세기 조각의 첫 장을 장식하는 작품이자 이후 전개될 조선후기 조각의 조형이 된다는 점에서 큰 의의가 있다. 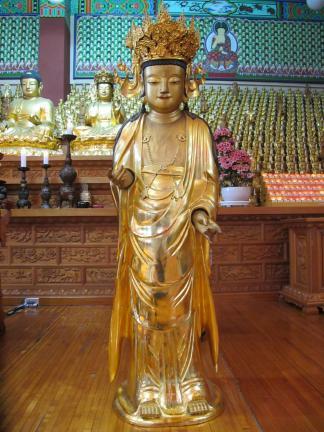 The Wooden Standing Bodhisattva of Gwaneumsa Temple in Iksan is famous for the written prayer discovered inside its secret repository, which contains detailed information about the restoration of the temple following its destruction during the Japanese Invasion of Korea in the Imjin and Jeongyu Years (1592-1598). This bodhisattva statue was produced by a monk-sculptor named Wono who made an important contribution to Korean Buddhist sculpture in the period between the late sixteenth and early seventeenth century. The statue displays the stable, realistic appearance characteristic of the carving techniques favored by the Wono School of Buddhist sculptors.